Back to the general about page. I'm a high school senior attending school at Polytechnic School in Pasadena, California. Physics and engineering seem pretty awesome to me. I've built a nuclear fusor and written a pamphlet about it. It's not my only hobby, though! 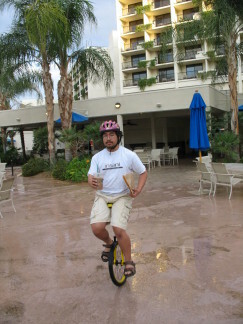 I spend lots of hours gawking at anime and getting giddy about the next episode of series <X>, and when I'm not waiting for an episode, I'm probably working on some harebrained idea or riding a unicycle. My resume and personal website. My email is raymond@naru.wsyntax.com. I can usually be found on synIRC as cyanoacry. A professor at Caltech who's helping out as an advisor.